I am currently seeking brilliant and highly motivated students and postdocs to join my research group at Cornell University in 2017. If you believe to be an exceptional candidate with interests in electromagnetism, metamaterials, nanophotonics, plasmonics, and/or acoustics/mechanics please feel free to contact me, or pass along the information to potential candidates. Two openings for graduate students will be available (for prospective students, please see application requirements and deadlines of the Cornell ECE graduate program). One Postdoctoral position will be available for an outstanding candidate. Interested candidates should email their CV and a brief description of their interests. I’m a Ph.D. Candidate in the Department of Electrical and Computer Engineering at The University of Texas at Austin in Austin, TX, USA. I received my B.Sc. and M.Sc. degrees in Electronics Engineering from Politecnico di Torino (Italy) in 2009 and 2011, respectively. Since August, 2011, I’m working as a Graduate Research Assistant in the Metamaterials and Plasmonics Research Group of Dr. Andrea Alù. My current research interests are in the areas of applied electromagnetics, metamaterials, plasmonics, and nanophotonics, with applications ranging from microwaves to optical frequencies, and with high scientific and industrial impact. My experience in three different continents has given me the opportunity to come in touch with stimulating, world-class research environments, with leading researchers and professionals from all over the globe. Wherever I work, I always bring with me a robust background in engineering and physics, a zest for challenges, an inextinguishable self-motivation, and an enthusiastic desire to learn all I can. July 5, 2016: Our paper on the theoretical limits of passive cloaking and invisibility has been published in Optica ! The paper is open access. Several news outlets have highlighted our work, including Huffington Post, Optics and Photonics News, VICE – Motherboard, Science Alert, Business Insider, UT ECE News, Physics.org, among others (press release). May 24, 2016: Our paper F. Monticone, and A. Alù, “Invisibility Exposed: Physical Bounds on Passive Cloaking,” has been accepted for publication in Optica. May 9, 2016: Francesco Monticone has received the WNCG Student Leadership Award from the Wireless Networking and Communications Group at UT Austin. 2015-2016: Francesco Monticone is serving as Sponsor and Exhibitor Organizer for Metamaterials 2016, The 10th International Congress on Advanced Electromagnetic Materials in Microwaves and Optics, which will take place in Chania, Crete, Greece, on September 17-22, 2016. January 2016: If you are interested in Mie scattering and its computational aspects, check out the nice paper by Robert A. Shore “Scattering of an Electromagnetic Linearly Polarized Plane Wave by a Multilayered Sphere: Obtaining a computational form of Mie coefficients for the scattered field”, published in the IEEE Antennas and Propagation Magazine (Francesco’s contribution is acknowledged in the text and in the Acknowledgements section). January 1, 2016: Our paper F. Qin*, L. Ding*, L. Zhang*, F. Monticone*, et al., “Hybrid bilayer plasmonic metasurface efficiently manipulates visible light,” has been published in Science Advances. Fall 2015: Francesco is currently spending a semester as visiting student researcher at the AMOLF Institute, Amsterdam, The Netherlands. September 1, 2015: Our invited review paper R. Fleury*, F. Monticone*, and A. Alù, “Invisibility and Cloaking: Origins, Present, and Future Perspectives,” has been published in Physical Review Applied. July 20, 2015: Francesco Monticone has received an IEEE Photonics Society Graduate Student Fellowship! “The IEEE Photonics Society established the Graduate Student Fellowship Program to provide Graduate Fellowships to outstanding Society student members pursuing graduate education within the Society field of interest (electro-optics, lasers, photonics, optics, or closely related fields)”. The Society awards up to ten Fellowships each year worldwide, based on research excellence and contributions to the Society’s publications and conferences. This award has been featured in the UT ECE News. July 7, 2015: Francesco Monticone is the recipient of an “FGSA Travel Award for Excellence in Graduate Research” to support his participation to the 9th International Congress on Advanced Electromagnetic Materials in Microwaves and Optics – Metamaterials 2015, Oxford, UK, September 7-10, 2015. “The FGSA Travel Award recognizes graduate students who have made noteworthy progress in their academic careers. This includes both graduate students who demonstrate great potential as well as those with considerable accomplishments in their field“. May 26, 2015: Our paper F. Monticone, and A. Alù, “Leaky-Wave Theory, Techniques and Applications: From Microwaves to Visible Frequencies,” has been published in the Proceedings of the IEEE, accompanied by a prolog by J. Esch ! April 2015: Our review paper F. Monticone, and A. Alù, “Metamaterials and plasmonics: From nanoparticles to nanoantenna arrays, metasurfaces, and metamaterials” was the most downloaded paper from Chinese Physics B in 2014. March 30, 2015: F. Monticone has won a USNC-URSI Travel Fellowship Grant Award, “For technical merit”, to support the participation to the 2015 USNC-URSI National Radio Science Meeting in Vancouver, Canada, July 19-25, 2015. March 20, 2015: Our conference paper F. Monticone, C. Valagiannopoulos, and A. Alù, “Aberration-Free Planar Focusing based on Parity-Time Symmetric Nonlocal Metamaterials,” to be presented at the 2015 IEEE International Symposium on Antennas and Propagation and North American Radio Science Meeting, has been selected for an Honorable Mention. February 18, 2015: Our paper X. Ding*, F. Monticone*, K. Zhang, L. Zhang, D. Gao, S. N. Burokur, A. de Lustrac, Q. Wu, C. W. Qiu, and A. Alù, “Ultrathin Pancharatnam-Berry Metasurface with Maximal Cross-Polarization Efficiency,” has been published in Advanced Materials, Vol. 27, No. 7, 1195–1200. December, 2014: Our work on “Doing Math with Light” has been selected and published in the Special Issue of Optics and Photonics News, “Optics in 2014”. This special issue highlights the most exciting peer-reviewed optics research to have emerged over the past 12 months. November 21, 2014: Francesco Monticone is officially a PhD Candidate in the Department of Electrical and Computer Engineering at The University of Texas at Austin. 2014-2015: Francesco Monticone is serving as Sponsor and Exhibitor Organizer for Metamaterials 2015, The 9th International Congress on Advanced Electromagnetic Materials in Microwaves and Optics, which will be held in Oxford, UK (Wadham College – University of Oxford) on September 7-12, 2015. November 3, 2014: Our paper F. Monticone, and A. Alù, “Trapping Light in Plain Sight: Embedded Eigenstates in Open 3D Nanostructures,” has been published in Forum for Electromagnetic Research Methods and Application Technologies (FERMAT), Vol. 6, No. 1. September, 2014: Francesco Monticone has been named the recipient of the Homer Lindsey Bruce Graduate Fellowship from The University of Texas at Austin Graduate School! September 18, 2014: Our invited feature article F. Monticone, and A. Alù, “The quest for optical magnetism: from split-ring resonators to plasmonic nanoparticles and nanoclusters” has been published online in Journal of Materials Chemistry C.
September 12, 2014: Our book chapter P. Y. Chen, F. Monticone, C. Argyropoulos, and A. Alù, “Plasmonic Optical Nanoantennas,” has been published in “Modern Plasmonics”, 1st Edition, Edited by A. Maradudin, J. R. Sambles, W. L. Barnes, Elsevier. August, 2014: Our invited paper F. Monticone, and A. Alù, “Physical bounds on electromagnetic invisibility and the potential of superconducting cloaks” has been published in Photonics and Nanostructures – Fundamentals and Applications, Special Issue for Metamaterials 2013, Vol. 12, No. 4, 330–339. May 29, 2014: Our paper F. Monticone, and A. Alù, “Embedded Photonic Eigenvalues in 3D Nanostructures” has been published in Physical Review Letters, Vol. 112, No. 21, 213903, and has been selected as Editor’s Suggestion. May 29, 2014: Our paper J. Shi*, F. Monticone*, S. Elias*, Y. Wu, D. Ratchford, X. Li, and A. Alù, “Modular Assembly of Optical Nanocircuits” has been published in Nature Communications, Vol. 5, No. 3896. April 16, 2014: Francesco Monticone has been awarded a prestigious Graduate School Endowed Fellowship! April 4, 2014: Our conference paper F. Monticone, V. Galdi, N. Engheta, and A. Alù, “‘Computing Metasurfaces’ to Perform Mathematical Operations”, to be presented at the 2014 IEEE AP-S International Symposium on Antennas and Propagation, has been selected for an Honorable Mention. March 27, 2014: Our invited review paper F. Monticone, and A. Alù, “Metamaterials and Plasmonics: From Nanoparticles to Nanoantenna Arrays, Metasurfaces and Metamaterials” has been published in Chinese Physics B, Vol. 23, No. 4, 047809. It is currently the most downloaded paper of the journal issue, with more than 400 downloads in few days. It is already in the list of the most downloaded papers published in the last one year. March 1, 2014: Read this article on The Alcalde about my advisor, Dr. Andrea Alù, and our research on invisibility cloaks and metamaterials that perform mathematical operations. January 10, 2014: Our paper on computational metamaterials has been published in Science, accompanied by a nice Perspective by Ari Sihvola and several news highlights (NBC News, Phys.org, Nanowerk, AzoNano, Laser Focus World, Tech Times, La Repubblica, New Scientist, Live Science, ANSA, Penn Current, UT News, among others)! November 26, 2013: Our paper on metamaterial-enhanced nanophotonics has been selected and published in the Special Issue of Optics and Photonics News, “Optics in 2013”. This special issue highlights the most exciting peer-reviewed optics research to have emerged over the past 12 months. November 19, 2013: Our recent PRX paper on cloaking bounds is also covered by Gizmag, National Journal, Mashable, The Horn, Bio News Texas and Time Magazine. November 12, 2013: Our paper about performing mathematical operations with metamaterials has been accepted for publication in Science! More news to come. November 7, 2013: BBC, NBC News, Physics World and Live Science feature our work on global cloaking bounds recently published in Physical Review X.
November 7, 2013: Francesco’s IEEE Antennas and Propagation Society Doctoral Research Award has been featured in the UT ECE News. October 29, 2013: Francesco Monticone has received an IEEE Antennas and Propagation Society Doctoral Research Award. The annual award is only given to a few students worldwide and is based on their current research achievements and potential to become future leaders in the electromagnetics research community. The award will be announced in IEEE Antennas and Propagation Magazine. October 21, 2013: Our invited paper F. Monticone, and A. Alù, “Do Cloaked Objects Really Scatter Less?,” has been published in Physical Review X, Special Issue on Metamaterials, Vol. 3, No. 4, 041005 (10 pages). October 1, 2013: Our paper C. Argyropoulos, F. Monticone, G. D’Aguanno, and A. Alù, “Plasmonic Nanoparticles and Metasurfaces to Realize Fano Spectra at Ultraviolet Wavelengths,” has been published in Applied Physics Letters, Vol. 103, No. 14, 143113 (4 pages). September 30, 2013: Francesco’s Best Student Paper Award at the Metamaterials 2013 conference has been featured in the UT ECE News. September 19, 2013: F. Monticone has won the 1st prize at the Metamaterials 2013 Student Paper Competition with the paper F. Monticone, and A. Alù, “On the Physical Bounds of Cloaking and Invisibility” ! September 6, 2013: F. Monticone has won an Incubic/Milton Chang Travel Award from Optical Society of America (OSA). June 26, 2013: F. Monticone has been selected as a finalist of the student paper competition at the 7th International Congress on Advanced Electromagnetic Materials in Microwaves and Optics – Metamaterials 2013, in Bordeaux, France, September 16-21, 2013, with the paper F. Monticone, and A. Alù, “On the Physical Bounds of Cloaking and Invisibility”. June 17, 2013: Our invited paper C. Argyropoulos, N. Mohammadi Estakhri, F. Monticone, and A. Alù, “Negative Refraction, Gain and Nonlinear Effects in Hyperbolic Metamaterials,” has been published in Optics Express, Focus Issue on Hyperbolic Metamaterials: Fundamentals and Applications, Vol. 21, No. 12, pp. 15037-15047. June 5, 2013: F. Monticone has been elected Full Member of the scientific honor society Sigma Xi. May 30, 2013: Phys.org features our work on meta-transmitarrays recently published in Physical Review Letters. May 2013: Visit the new section Press Interest, with a selected list of recent press releases and highlights on our work. May 2013: Read the Physics Viewpoint “Wave-Shaping Structures” by my advisor Dr. Andrea Alù about novel solutions to control wave transmission with ideal efficiency at microwave and optical frequencies. May 14, 2013: Our paper F. Monticone, N. Mohammadi Estakhri, and A. Alù, “Full Control of Nanoscale Optical Transmission with a Composite Metascreen,” has been published in Physical Review Letters, Vol. 110, No. 20, 203903 (5 pages). The paper has been selected as PRL Editor’s suggestion! March 18, 2013: Our conference paper F. Monticone, Xiaoqin Li, and A. Alù, “Strong Optical Magnetism and Fano Resonances in Asymmetric Plasmonic Metamolecules”, submitted to the Student Paper Competition of the 2013 IEEE AP-S International Symposium on Antennas and Propagation to be held in Orlando, Florida has been selected for an Honorable Mention! March 12, 2013: Our paper F. Monticone, C. Argyropoulos, and A. Alù, “Multi-Layered Plasmonic Covers for Comblike Scattering Response and Optical Tagging,” has been published in Physical Review Letters, Vol. 110, No. 11, 113901 (5 pages). The paper has been selected as PRL Editor’s suggestion! February 19, 2013: Watch my advisor Dr. Andrea Alù talking about metamaterials and invisibility in this intriguing TEDx Talk! Coverage from the UT Cockrell School of Engineering and the script are here. February 6, 2013: Our paper F. Monticone, C. Argyropoulos, and A. Alù, “Multi-Layered Plasmonic Covers for Comb-Like Scattering Response and Optical Tagging,” has been accepted for publication in Physical Review Letters. This paper has been selected as Editor’s suggestion! January 29, 2013: A News and Views article from Peter Nordlander highlighting our recent Nature Nanotechnology paper on magnetic-based Fano resonant nanocluster has appeared in the same issue! January 27, 2013: Our paper F. Shafiei*, F. Monticone*, K. Q. Le, X. X. Liu, T. Hartsfield, A. Alù, and X. Li, “A Subwavelength Plasmonic Metamolecule Exhibiting Magnetic-Based Optical Fano Resonance,” has been published in Nature Nanotechnology ! * These authors contributed equally to this work. December 2012: F. Monticone has won a USNC-URSI Travel Fellowship Grant Award, “For technical merit”, to support the participation to the 2013 USNC-URSI National Radio Science Meeting in Boulder, CO, USA. 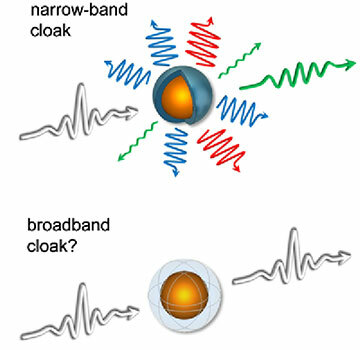 December 3, 2012: the invited paper F. Monticone, C. Argyropoulos, and A. Alù, “Layered Plasmonic Cloaks to Tailor the Optical Scattering at the Nanoscale,” has been published in Scientific Reports, Special Issue for E-MRS 2012, Vol. 2, No. 912. November 26, 2012: the paper F. Monticone*, F. Shafiei*, K. Q. Le, X. X. Liu, T. Hartsfield, A. Alù, and X. Li, “A Subwavelength Plasmonic Metamolecule Exhibiting Magnetic-Based Optical Fano Resonance,” has been accepted for publication in Nature Nanotechnology.